Record numbers of families are now going to courts to fight for inheritance they believe is rightly theirs – back in 2013 97 disputes were heard at the High Court, leaping to 164 cases by 2015. Cases heard at the High Court are only the most serious of cases therefore there are likely many more cases of inheritance disputes in addition to these. So, what is the cause of all these disputes? Legal experts say soaring house prices are largely to blame, as families on relatively modest incomes have been turned into property millionaires almost overnight. Modern families bring with them more rows as there are more divorces, second marriages, stepchildren, half children and generally more complication and potential for disagreements. To find out more reasons Why today’s modern families need professional Will writing advice check out our previous blog. The recent case of Lynda Bellingham’s inheritance is one such example of disputes arising. Her sons challenged her Will after receiving only £750 each. Their stepfather has since given them a mortgaged flat between them, however after legal costs and the fact that they will have to sell the flat and pay £30,000 in capital gains tax the boys say they will be left with less than £50,000 each -whilst their estranged stepfather sits on a £5 million estate. They accuse Michael Pattemore, her third husband, of not following what they claim was her wish that they be looked after following her death. Make a Will and keep it up-to-date. Approximately 27 million adults in the UK do not have a Will when they die which means their estate will be divided amongst their relatives according to the laws of Intestacy. If you die without a Will then any wishes you may have had for your estate, and that you may have voiced to your family but not confirmed legally, will not happen and your estate will be divided up according to the law. This can cause obvious issues as the law may not benefit your family as they would have hoped and expected. Read our blog: 5 things that may happen if you die without a Will, for more information on this. If you do have a Will it is important that this is kept up-to-date as family changes could mean that someone is left out of your Will that shouldn’t be or someone is left in that may not be as you would want. For example, if you are separated but not divorced, your ex could still potentially inherit over any new partner, or even your children. Take our Life Audit to see how your life has changed in the last 5 years. Low cost Wills, or DIY Wills may seem like a good money-saving idea, however an incorrectly written Will could result in an invalid Will. Something simple like an incorrectly spelt name, not using the correct wording, or if they are not signed, dated and witnessed as they should be can invalidate a Will. In addition to the risk of the Will not being valid, by not seeking professional advice you risk not distributing your estate in the most tax-efficient way, and the risk of leaving your wishes more open to dispute by not having a watertight Will. For 5 steps to a Watertight Will read our blog. 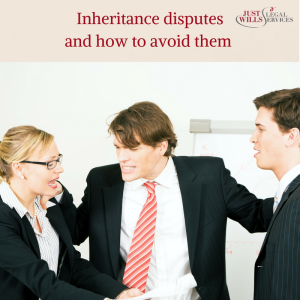 Will disputes can often come around when beneficiaries are surprised by the outcome of a Will. Whilst you may have your reasons for what you have left to whom, if that is not clear to people then it can be a cause for dispute. By discussing your Will in advance, you can make sure that everyone understands your wishes as you intend them, and nothing is misunderstood. Alternatively, you could leave a letter with your Will outlining your reasons for leaving your estate to your chosen beneficiaries. A letter can also be beneficial for the distribution of smaller, more personal items. Save your family the stress and heartache of a loved one challenging your Will when you die. Make sure you have taken every possible step to ensure your Will is up-to-date, watertight and your family / beneficiaries are aware of your wishes. If you’d like to book a free consultation with one of our legal experts to discuss your Will – book online or call 01342 477 102 and quote ‘Inheritance disputes and how to avoid them‘.